Since his teen years, Mr. Edwards has had a penchant for contemporary architecture, beginning with his introduction to the futuristic visions of Frank Lloyd Wright with the opening of the Guggenheim Museum in New York City. He has closely followed the careers of both Frank Gehry and Richard Meier, photographing many of their architectural triumphs. His photographs reflect both the artistic eye of his father and the vision of the architects. The Frank Gehry-designed Walt Disney Concert Hall is one of the most sophisticated concert halls in the world. From its perch on a hill overlooking the old heart of Los Angeles, the stainless steel curves of the exterior of this Gehry creation provide a striking addition to the unique energy and creative spirit of the city. 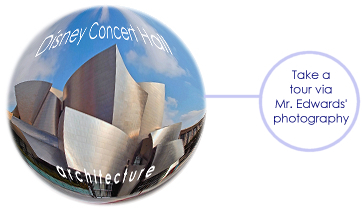 Take a virtual tour of Disney Concert Hall via Robert L. Edwards photographs. Perched high atop the Santa Monica Mountains, the Getty Center is a sprawling, travertine stone, steel, aluminum, concrete and glass complex designed by Richard Meier. Two grids define the space dividing the import of the buildings on it: Along one axis lie the galleries and along the other axis lie the administrative buildings. Meier’s awesome 24-acre vision provides a sweeping east-to-west panorama of everything from Hollywood to the Pacific Ocean. 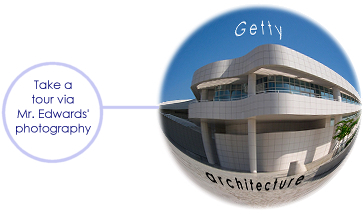 Take a virtual tour of the Getty Center via Robert L. Edwards photographs.